While ADA signs are often a matter of legal compliance, their value extends well beyond behaving in accordance with the law. 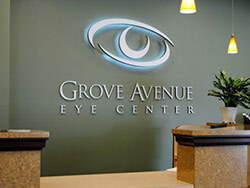 Effective ADA signage gives your business an air of openness and accessibility, appealing to a broad audience. ADA refers to the Americans with Disabilities Act, which was passed in 1990 to ensure equality of access to all Americans. The ADA is most commonly associated with installations like wheelchair ramps and elevators in new buildings but, but its scope and effect extends much farther. ADA Signage with Braille – Exit Stair Down. Topa Financial Tower, Oxnard, CA. ADA signage is meant to ensure ease of communication with individuals with a spectrum of possible disabilities. For example, signs often feature braille so that they are understandable to blind or visually impaired individuals. There are a few elements to keep in mind when it comes to installing ADA signs at your business or organization. One key element of ADA signage is that they must have non-glare backgrounds and characters, making them far easier for the visually impaired and the elderly to read. Typefaces should be easy to read, and language should be simple and understandable. Well designed and thoughtfully considered ADA signage also benefits people with hearing impairments, people who have problems speaking, or people with cognitive disabilities who may rely on signage as an alternative to speaking with somebody they don’t know to ask for help. ADA signs often feature one or more of the four “accessibility” symbols: the wheelchair symbol which is recognized internationally, as well as symbols to indicate assistive systems for people with hearing impairments. ADA Signage – Woman’s Restroom. Topa Financial Tower, Oxnard, CA. ADA signs are most practical when located immediately next to the door of the room they apply to, so that they are easy for people with visual impairments to locate, and should have both visual and tactile components. ADA Signage – In Case of Fire Sign. Topa Financial Tower, Oxnard, CA. ADA signage is often legally necessary to comply with federal law, but most businesses and organizations choose to use ADA-compliant signs anyway, in order to ensure that they are providing equally simple access to all of their potential visitors. Whatever your reason for choosing to install ADA signage, Dave’s Signs is well versed in all the requirements for providing equal accessibility and making them custom tailored to your buildings aesthetic. Give us a call at (805) 641-1387 or reach out to us online.